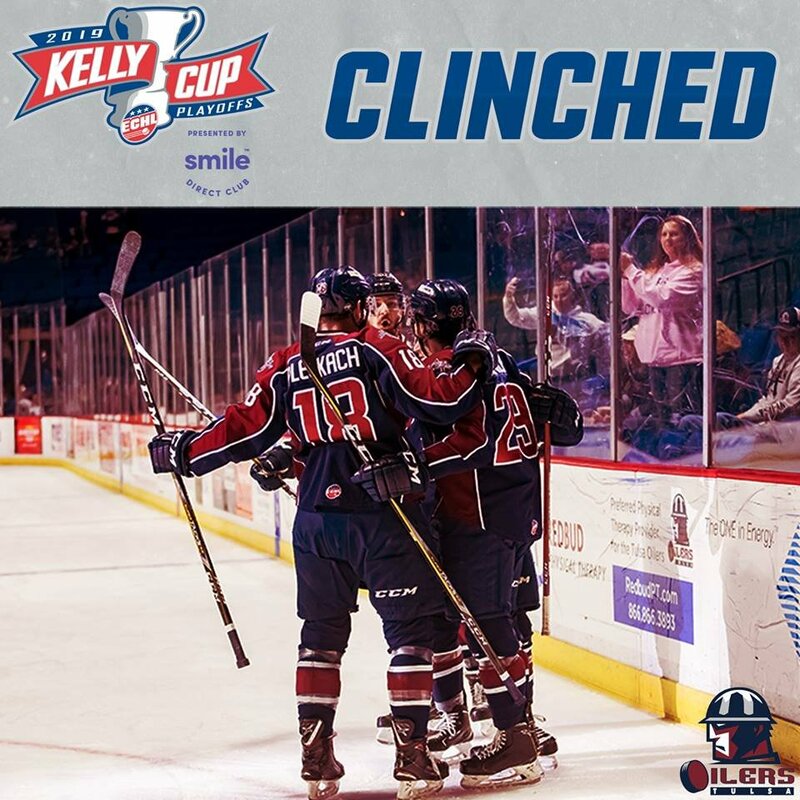 >> The Tulsa Oilers finished their season series against the Allen Americans with a 4-0 shutout win Tuesday at the Allen Event Center. Ian McNultysparked a three-goal second period when he put the Oilers on the board. Ryan Tesinkadded a goal right after a power play ended, and Charlie Sampairmade it 3-0 just over three minutes later. Captain Adam Pleskach, playing in his 400thpro game, scored a late power play goal in the third period to complete the scoring as he tied Allen’s Zach Pochiro atop the ECHL leaderboard with his 33rdgoal. Ian Keserichstopped all 21 Americans shots to earn his first shutout of the season. >> The Oilers fell behind 1-0 early Saturday in Independence, but tied things up when Charlie Sampairraced in on a short-handed breakaway and snapped a shot into the net. Kansas City went back in front 2-1 before the end of the first and carried that lead into the third. Stephen Perfettotied the game late in a power play with 6:56 left in regulation, and Eric Draplukput Tulsa ahead for good with 4:32 remaining when he ripped a shot into the top of the net on a 4-on-2 rush. Dylan Bredo gave the Oilers some insurance with 2:28 to play, and Roman Ammirato added an empty-net goal with 1:14 left on the clock to make it 5-2. Sampair scored his second of the game for good measure with 30 ticks up on the clock. With the win, the first place Oilers clinched a playoff berth for the first time since the 2014-15 season, with nine games remaining in the regular season. Charlie Sampairrecorded his first career 5-point game (2g, 3a) Saturday in Kansas City. Stephen Perfetto has a 5-game point streak (2g, 8a). Ian Keserich’s shutout Tuesday was his first since Nov. 10, 2012 and his first ECHL shutout since Jan. 9, 2009. The Oilers became the 3rd team in the ECHL to clinch a playoff spot Saturday, following Cincinnati and Florida. Saturday’s third period comeback was the 2ndtime Tulsa has scored 5 goals in a period this season. Tulsa is one win (37) and two points (80) away from tying a franchise-best mark since joining the ECHL. Adam Pleskachis tied for 1stin the ECHL with 33 goals, 4thwith 63 points and tied for 1stwith 13 power play goals… Charlie Sampairis tied for 2ndwith 7 game-winning goals… Ryan Tesinkis tied for 14thin points (57)… Devin Williams is 2ndin the ECHL in goals-against average (2.21)… Dylan Bredois tied for 5thamong league defensemen in assists (31) and tied for 9thin points (36)… Steven Kaunisto is 2ndamong defensemen with 4 game-winning goals… Jared Thomasis tied for 3rdamong rookies with 54 points and 2ndin assists (36).